Rail travel has been an essential mode of transportation for centuries. Today, rail offers a distinct advantage over often congested air or automobile travel. Rail is a relaxing mode of travel that affords more leisure time which can be used for a myriad of purposes. Travelers today welcome that extra time to catch up on reading or emails at their leisure, surf the Web, or do other tasks that require high-speed Internet or Virtual Private Network (VPN) access. The foundation of all these activities is broadband connectivity. • Railway operations may include the exchange of critical data, including operational safety data such as maintenance systems status and emergency information, video monitoring using IP-based CCTV systems, telemetry data, and command and control systems known as Positive Train Control (PTC). This type of traffic is typically high priority. • Passenger services include the data and voice connectivity that today’s passengers expect. This type of Internet traffic includes activities like Web surfing, downloading videos and files, online gaming, and VoIP traffic. In addition to data services, linking of travelers’ cellular phones via micro or pico-cells enables them to communicate even in areas where cellular towers do not exist. Forecasts show land mobile bandwidth utilization growing at a steady pace across both conventional Ku-band and High-Throughput Satellites (HTS), which are typically Ka-band (Figure 2). Much of this growth will be on passenger rail transport, similar to the surge of airborne broadband. Similar to airborne broadband, the ideal networking technology for rail is via satellite. The use of cellular (3G/4G) services for backhaul is possible but is an incomplete option in the case of rail due to the high traffic requirements and typical gaps in terrestrial cellular coverage over the route of a long-haul train. A direct connection to cellular systems alone cannot meet the consistent quality expected by customers for the duration of a journey. 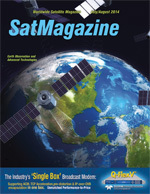 Only satellite-based solutions can address these challenges in a comprehensive and cost-effective way, especially with the growing availability of less expensive Ka-band bandwidth. All mobility applications—airborne, maritime, and land-mobile alike—face similar challenges related to signal interference caused by physical line-of-sight (LoS) obstructions. But land-mobile is likely to face the most extreme and unpredictable obstructions (Figure 3). In a fixed satellite installation, the modem or router locks onto a synchronization signal received from the satellite. It’s used to synthesize the transmit clock, which serves two purposes: it ensures the transmit center frequency is correct, and the burst timing is synchronized. In Time Division Multiple Access (TDMA) systems, this synchronization is crucial. Without it, bursts from different modems will not be aligned and can interfere with each other. In rail mobility applications, the clear signal reception is not guaranteed due to the aforementioned obstructions. It requires that the regeneration of the clock for the transmission is derived from another source if interruptions occur for more than several seconds. In the case of short interruptions, typically less than 30 seconds, the modem’s own internal clock can “free-wheel” or “fly-wheel” in order to bridge the gap. However, this free-wheeling is not sufficiently accurate over longer periods. In the absence of an external clock reference, the modem must turn off the transmitter in order to prevent problems with the transmissions of other terminals using the same in-route. As a train moves across the footprint of the satellite beam, the receive signal level may vary, especially towards the edge of the beam. Changing atmospheric conditions may also cause receive and transmit signal degradation. To maintain a high-quality service, the satellite modem and hub must take these factors into account by dynamically changing the modulation and/or coding used, and by changing the transmit power in the satellite in-route direction. Speed is another issue. The modem must also account for Doppler shifts in the signal. Doppler shifts cause changes in symbol timing, which has a worsening effect in the modem as modulation complexity increases. Therefore, it is crucial that the speed and direction of the train be known, so that algorithms can be applied to correct for the frequency shift. In some cases, a train may cross from one satellite’s coverage area to another. Or, as would be the case for the newer HTS satellites utilizing spot beams, trains move from one spot beam to another. In either scenario, the satellite system must be able to seamlessly hand off traffic from one beam to another. • Full IPv6 support to future proof the network and accommodate a virtually unlimited number of user devices on board. • Adaptive Coding and Modulation (ACM) to allow the downstream satellite channel to be continually optimized as the train travels through the various contours of the satellite footprint. • TDMA Channel Spreading to overcome issues with off-axis emissions and enable the use of very small antennas to mitigate adjacent satellite interference. • Doppler Compensation to counter balance frequency shifts. • IP Steady State to maintain IP sessions during even prolonged periods of link outages, such as when a train travels through a tunnel. 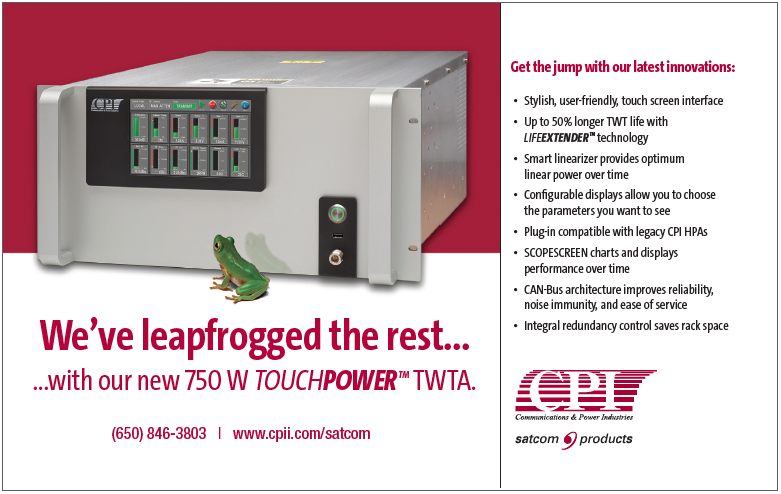 • Ruggedized Chassis to withstand environments of high heat, humidity, dust, and vibration. • Automatic Beam Switching to determine location and timing to command the antenna to switch to a new satellite. 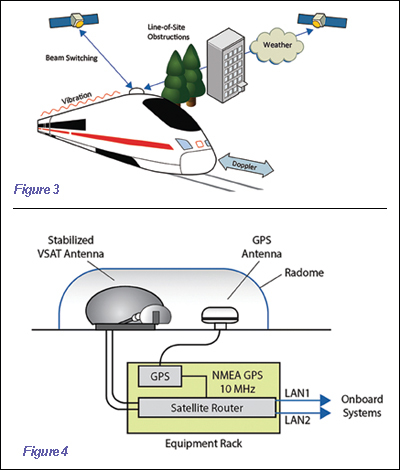 The basic satellite infrastructure required on board the train includes a stabilized very small aperture satellite terminal (VSAT) antenna, a GPS receiver, and the satellite gateway/router system (Figure 4). Because the network traffic shares a single transmission path, it is vital that the services be differentiated. A good satellite system should provide support for VLANs, QoS and rules-based routing in both directions. This allows the highest-priority traffic, such as train telematics and voice traffic, to take priority over lower priority traffic, such as passenger Internet access. In some cases, the constant addition and removal of rail cars from a train prohibits the use of a wired (LAN) infrastructure on the train. A WiFi mesh network may be better suited to implement the onboard LAN/WLAN, especially for shorter trains (Figure 5). However due to the inherent linear nature of trains, inter-car wiring may be required—particularly for longer trains—in order to prevent WLAN bottlenecks. Enterprise-grade WiFi mesh systems should support multiple VLANs, Service Set Identifiers (SSIDs) and simultaneous multi-band in order to provide the separation of data, connectivity for devices, and other features necessary to implement this architecture. Continuous connectivity onboard a train may be desired when entering and exiting stations. As users board, they may want to start working immediately and continue to do so without interruption when the train leaves the station. Similarly, when a train arrives at a station, users who are not disembarking may desire uninterrupted connectivity. Many rail stations, especially in cities, are located in areas that are blocked by buildings, or even located underground. In order for the rail service operator to provide coverage in these areas, an alternative method of connecting data must be offered. This poses a challenge, especially if a seamless handoff is required. 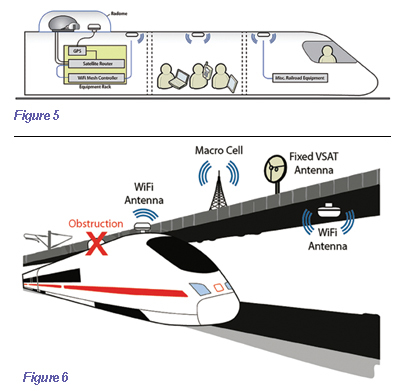 Cellular handoff would not require any additional infrastructure from the rail operator; however, the handoff from the onboard microcells or picocells to the macrocells in the rail stations may not be completely seamless to users. Dropped calls may occur when calls are handed off from the relatively high-latency backhaul provided by the satellite connection to the relatively low-latency connection that the macrocell uses. Everybody expects connectivity everywhere, especially while traveling. 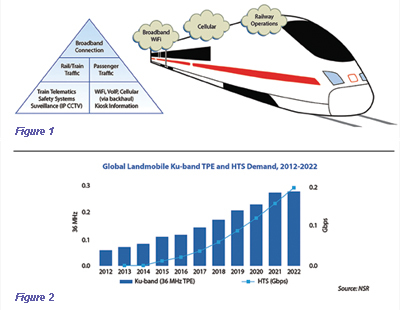 Train operators seeking to provide mobility solutions for operational use and customer enjoyment are best served by adopting Satellite-On-The-Move (SOTM) broadband, due to the technology’s ability to provide high bandwidth, broad coverage and uninterrupted service in an always changing, unpredictable railway environment.